Get carried away with your love of wine and birding by adding this Woodlink Novelty Wine Crate Cedar Bluebird House to your yard. This adorable, cedar roost perfectly mimics a wine crate, combining your love of birds with your appreciation of wine. Realistic etchings of grape clusters on the top and front panel of the home further the motif, completed by the words "Chardonnay," "Chateau de Guillerval," and "Grand Vin de France". A 1.5" diameter opening on the front panel allows bluebirds or swallows to enter the shelter, and the elevated floor panel provides a convenient nesting area. Horizontal lines beneath this opening create a ladder, allowing fledglings to reach the exit when ready, while the sloped roof directs water away from the nest. Slide the front panel downward for nest checks or seasonal maintenance, and use the metal tab inside the box to keep it in place. A rope loop on the back of this home not only enhances the crate look; it also makes it simple to hang the shelter from a bracket. For a different look, affix the back of the item to a wall or post, or slide a 1" outer diameter pole through the holes on the inset base. Silver colored, metal flashing along the top lip contrasts the rest of the cedar frame, and will gleam in sunlight for a fun accent. The 0.625" thick cedar helps keep the roost warm for your feathered friends, and the slide-in front panel provides ventilation. 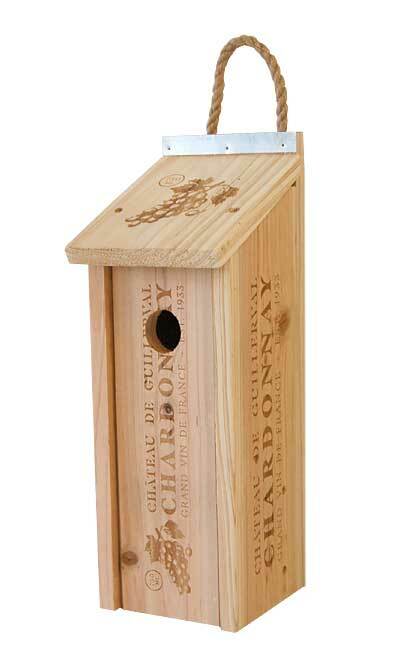 Celebrate birds and your favorite wine at once with this Novelty Wine Crate Cedar Bluebird House. Woodlink Torpedo Raccoon Baffle, Black, 8" dia.